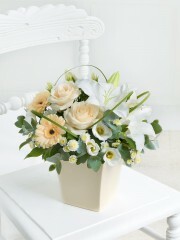 It is always a difficult time when a loved one sadly passes away and we at Ellon Flowers understand this completely. 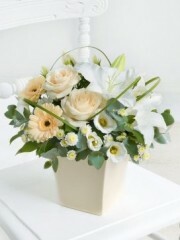 Our Ellon Florists empathise with your loss and would be more than happy to arrange flowers to be sent to comfort the family or friends of the deceased. This would be done to your request to ensure yours and the recipient’s wishes are well respected. At Flowers Ellon we have a wide variety of flowers to choose from and our professional florists would be able to give advice to help you pick the most suitable bouquet. 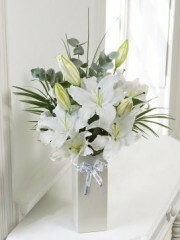 From our selection of the finest, fresh flowers in our Ellon flower shop we would be able to create a beautiful bouquet that would be the perfect way to show your condolences. In our Ellon flower shop, we have a huge range of different flowers in a variety of colours which can be picked to your preference, or alternatively you may request the choosing and advice of our expert florists. At Ellon flowers, we understand that at such a stressful, emotional time it is the smallest things that count and you could be able to show this through your order of flowers. 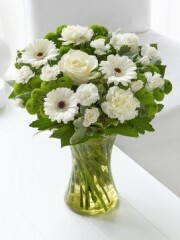 Sympathy flowers are the most wonderful way to let your recipient know that you are thinking of them in their time of difficulty and would help show your empathy. You can also add a special touch to your order by adding a personal message on a card you could help your recipient’s spirits be uplifted in their moment of grief. Our Ellon florists can ensure that through our beautiful flower arrangements your wishes of respect and commiseration comes across tactfully and appropriately. 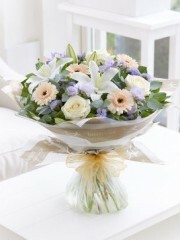 Here at Ellon flowers we are pleased to offer same day delivery on all our orders. To do this, you must confirm your order before 3pm. This would allow our skilled Ellon florists to adequately choose the freshest flowers and consequently prepare your order to be sent off in the same day. In these stressful times our Ellon flower delivery service will help take some of the strain off and will ensure your flower arrangement is delivered to the right place at exactly the right time. 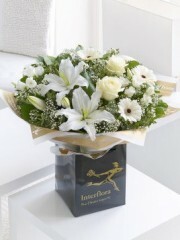 By offering same day delivery at Flowers Ellon, you can be certain that your order is received at the right moment to offer your utmost sympathy and compassion. Our Ellon flower delivery drivers can guarantee your order is delivered straight to your recipient’s door which would consequently add a more personal touch to your gift. 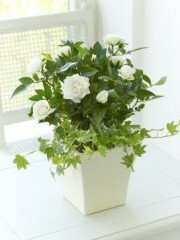 Not only do we offer this as a service, but we also are able to deliver to anywhere in the UK. This means that you can reach your loved ones easily in their time of need, no matter where they stay and would allow you to offer your condolences appropriately. Customer satisfaction is the first priority for us here at Flowers Ellon so you know you’ll be able to count on us when you need flowers at any point in the year and for any occasion. Flowers Ellon deliver six days a week and create arrangements to suit any requirements or preferences you may have. Whatever you need we’ll make sure your order is done in the highest quality to ensure you are happy with your order. Ellon Flowers can supply you with something gorgeous that will bring a little joy into your recipient’s home even at a sad time. Contact Ellon Florists for further information.